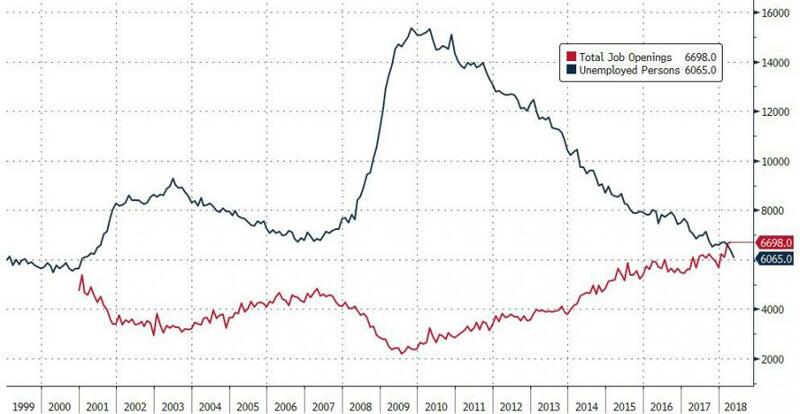 As we reported yesterday, for the first time in history, the number of job openings in the US (6.7MM) has surpassed the official number of unemployed workers (6.1MM). And yet something about that number does not make sense. When we reported on the jobs number back on June 1, we observed that the number of people not in the labor force has risen to nearly 96 million, and while much of this is due to demographics, and the America's "opioid" epidemic, a lot can be assigned to an increasingly inefficient labor market that lacks dynamism. Subsequent deep dives into the jobs number show us that the health of the job market may not be on a par with where it was back in 2006 , and that the job market "health" may be judging a book by its cover. One such indicator to note is the amount of churn that occurs between jobs: churn is supposed to give an indication of how active participants in the workforce are in looking for better opportunities than the ones they currently have. In a market where there was recently more job openings than there were unemployed people to fill them, as was reported by the Wall Street Journal, one would expect churn to be at, or exceeding, levels it has previously been at during times of a "healthy" economy. However, churn data shows no such thing. In fact, churn is still lower than it was in 2006 when unemployment was 4.8%. Some more details from the WSJ, which echoes what we said yesterday, namely that "the economy hit a new milestone in April, the Labor Department reported Tuesday. For the first time since record-keeping began in 2000, there were more job openings than there were unemployed people to fill them. It is the result of the steady job gains that have sent the unemployment rate down to 3.8% last month." However, "the big surprise is that with all of those openings, people aren’t changing jobs as much as you’d expect." Alongside the job-opening data it reported Tuesday, the Labor Department also released figures on job openings and what it calls job separations (which include job quitters, people who got laid off and people who retired). That data can be used to gauge how much movement between jobs, or “churn,” is going on. High levels of churn are considered a feature of a healthy job market. 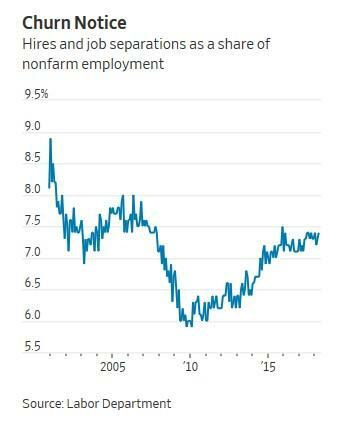 One measure of churn—the sum of hires and separations as a share of overall employment—stood at 7.4% in April, around where it has been for the past year. That is far better than the 5.9% it plumbed in 2009, but still below the 8% it reached in 2006 when the unemployment rate was 4.6%. According to the WSJ's Justin Lahart, the lack of churn likely has to do with the aging of the US workforce, validating the point that unemployment is moving lower because more and more senior citizens, who would normally be expected to retire, are forced to say in, in certain, stereotypical cases as part-time Walmart greeters. And as workforce ages, older workers are less likely to job hop. as housing costs continue to rise, particularly in some of the core urban areas where job openings are most plentiful. Meanwhile, many workers may still have lingering fears, sown during the recession, about leaving the security of an existing job for a new one. The good news is that more people are quitting their jobs: the quits rate, which as Nicholas Colas dubbed the "take this job and shove it" indicator, as it measures the degree of confidence workers have in finding a new job, is the highest it has been since 2001. But fewer people are leaving their jobs for other reasons, pushing the churn rate lower. 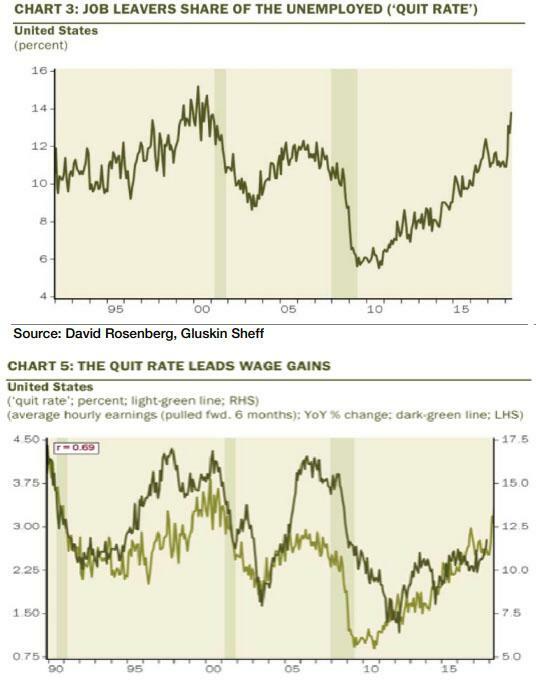 Meanwhile, for companies, the low churn rate has been both good and bad. The good part is that it makes it easier to retain the employees, which helps keep labor costs lower. That mainly benefits companies that aren’t aiming to grow. The bad part, which mostly affects companies looking to expand their workforce, is that it can be hard to hire people without offering them strong incentives to do so. And those incentives usually involve higher pay.